This article is an anarchist analysis of the 1916 insurrection (which started on Easter Monday in 1916, EiE) and the war of independence in the context of the struggle for socialism in Ireland and internationally. It concentrates on the ‘unknown’ but intense class struggle that ran alongside the war of independence and the role republicanism played in the suppression of that struggle. It asks ‘what is freedom’ and shows how anarchism originated amongst earlier European left republicans as an answer to the limitations of republicanism. Originally published by Indymedia IE in 2006 (90 years after the Easter insurrection of 1916) and in the pamphlet The rising of the moon (PDF file). Written by Andrew N. Flood. 1916 – just what are we celebrating? There is something very odd with the official commemoration of 1916. The same government which is celebrating an insurrection against imperialism 90 years ago (this article was orginally published in 2006, EiE) is today – against the wishes of the majority of the Irish people – allowing Irish airports to be used in support of an imperialist war. And whereas the 1916 proclamation referred to “the right of the people of Ireland to the ownership of Ireland” successive southern governments have shown themselves to be on the side of international corporations. Currently this has manifested itself in the manner in which the Corrib gas fields off Co. Mayo have been handed over to the Shell corporation. The reason they can get away with this hypocrisy is because the 1916 proclamation is long on rhetoric about “dead generations” and “august destiny” but short on any sort of concrete program, never mind one that addressed the needs of the working class. The 1916 proclamation says very little about the sort of Ireland the rebels wanted to see. This has allowed every party in the south to claim to stand in its tradition in the 90 years since it was first read out. The rising was heroic and it did shape the face of modern Ireland, but is there much in the rising for anyone on the left to celebrate? This blow against imperialism after all is somewhat undermined by the description of German imperialism in the second paragraph of the proclamation as “gallant allies in Europe”. And the promise that “The Republic guarantees .. equal rights and equal opportunities to all its citizens” holds no threat to European capitalism of today which also claims to stand for such things. Despite the fact that the Ireland of the time was deeply divided, right down to the formation of two rival and armed militas the proclamation simply “claims the allegiance of every Irishman and Irishwoman” despite “the differences” .. “which have divided a minority from the majority”. The bitter sectarian divisions that already existed in the Belfast working class were unlikely to be overcome in such a manner! Connolly has been quoted as saying at an Irish Citizens Army rally a week before the rising that “.. if we should win hold on to your rifles because the Volunteers may have a different goal. Remember we’re out not only for political liberty but for economic liberty as well” so certainly the left at the time was aware of the missing equality from the proclamation. As usual in reaching a compromise between socialism and republicanism the socialist element had to be pushed to one side. Landless labourers across Ireland took part in land occupations and in cattle drives. Workers occupied their workplaces and sought to keep production going. Pitched battles were fought between workers and police, republican police and even self styled ‘white guards’ set up by employers. Of the General Strike of April 1920 the Manchester Guardian noted “the direction of affairs passed during the strike to these [workers’] councils, which were formed not on a local but on a class basis. In most places the police abdicated, and the maintenance of order was taken over by the local Workers Council .. In fact, it is no exaggeration to trace a flavour of proletarian dictatorship about some aspects of the strike”. This was a time of militant syndicalist struggle across the European working class. In Ireland some of these workers would have been IRA members but the methods of struggle they used were not those of the Irish republicanism but of Italian anarchists, French syndicalists, British trade unionists and even Belfast shipyard workers. The sole contribution of the War of Independence, and in particular the IRA’s targeting of the forces of ‘law and order’, was the creation of a vacuum in which these workers’ struggles could progress much further than might have been otherwise possible. Peadar O’Donnell who was OC of 2nd brigade IRA (Derry and East Donegal) writing in 1963 observed “Many an IRA man in jail in ’22 and ’23 cursed his use as a defender of pure ideals to patrol estate walls, enforce decrees for rent, arrest and even order out of the country leaders of local land agitation” (7) In other words the IRA could protect the rich in a way that the RIC were no longer capable of. This was Irish republicanism at its most militant period, it was simultaneously a period when Irish workers were at their most militant. Yet the direct actions of these workers were seen as a hindrance to the republican struggle – something that threatened unity. Breaking these workers’ struggles was the way that the Dail won the allegiance of a large section of Irish capitalism. It demonstrated that unlike the British state it could maintain law and order and protect the property and land of the wealthy from the working class. So while left republicanism may look like an attractive short cut to socialism it is one based on building on sand. The weakness of republicanism is not in its failures but in its successes because success requires building nationalist unity, whether that be military as during the War of Independence or political as in the Peace Process. The price of such unity is constant – the marginalisation and removal from the agenda of any prospect of social revolution. Anarchism arose out of an understanding of the limits of socialist republicanism. Because of this it didn’t reject the core concepts of the republic, it built on them. What do we mean by this? Everyone, from George Bush and Michael McDowell talks of being for freedom but what does freedom mean? We have already seen how the 1916 proclamation talked only of “equal rights and equal opportunities” but left aside any mention of economic equality even though at least one of the signatories, James Connolly, knew this was a requirement for any real freedom. Liberty, Fraternity, Equality was the slogan that encapsulated the French revolution and captures the debate that was to follow, a debate out of which anarchism eventually emerged. The words sound fine but what do they mean? Does equality simply mean equality before the law, something that now exists in theory in the western world. Or does it mean equal access to all that is produced. In that debate is the gulf between Bush’s Republican party and anarchist communism. In the context of Ireland republicanism really starts just before the 1798 Rebellion. Rebellions before this date were about a return to more traditional rulers or whether we would be ruled by a protestant King of England or a catholic King of England. Whatever the mythologies built up by loyalism on the one hand and Irish nationalism on the other freedom, for the mass of the people, was never really on the agenda. “I believe in a revolution founded on the rights of man, in the natural and imprescriptable right of all citizens to all the land … As the land and its produce was intended for the use of man ’tis unfair for fifty or a hundred men to possess what is for the subsistence of near five millions …”. In the South today we live in a ‘republic’ but it is one where not much more than fifty or a hundred men possess what “is for the subsistence of near five millions”. In our republic 10 families owned almost all of the land suitable for housing around Dublin and because of this in the last decade they have become multi millionaires. Right from the origins of republicanism across the globe it represented an alliance which included those who wanted to go a lot further than political liberty and recognised that equality also required fundamental changes in property laws etc. The men of no property are not just key figures in 1798, they appear in every republican insurrection on the globe. The story of anarchism starts with the republican revolts that broke out all across Europe in the year 1848. 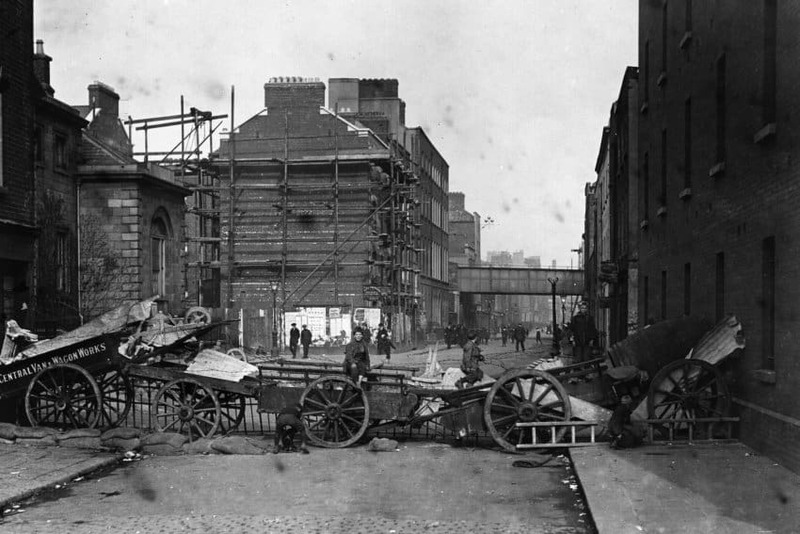 These revolts saw the emergence of very distinct working class movements that sought to introduce socialism as part of fight for the republic – the development of what today and in the Irish context we might call socialist republicanism. One republican active in those years was the Russian left republican Michael Bakunin who was later to become an anarchist. At this time the Slavic people were under the yokes of no less than four Empires, those of the Russian Czar, Austria-Hungary, the Ottomans (modern day Turkey) and the Prussians. Bakunin began to reject left republicanism after the 1863 Polish insurrection when he saw that the Polish nationalists were more interested in Ukrainian land than the support of the Ukrainian Slavs and that they were more afraid of Polish peasant insurrectionists than the Czar. In other words if they could not keep the working class in check the Polish capitalists were willing to sacrifice the republic. Bakunin went to Italy where he worked on an international project of revolutionary organisation with republican exiles from many countries. They sought a way to develop republican organisational structures and a set of principles that would see the abolition of class society rather than just swapping a foreign boss for a domestic boss. “Socialism without Liberty is brutality and slavery”. In 1916 admist the imperialist slaughter of the First World War Connolly decided that this limited program was worth fighting for. 90 years on we can admire those involved in the insurrection but at the same time the insurrection is a demonstration that even the most left of republicans, as Connolly then was, find themselves forced to drop the working class elements of their program in the interests of nationalist unity. Anarchism argued left republicanism was a dead end in the fight for freedom in 1866, Connolly’s sacrifice in 1916 only served to confirm this. This text is an extended version of the contribution I gave to the Anarchism and Republicanism debate with Tommy McKearney at the Anarchist bookfair.